The death toll in a powerful earthquake that hit West Nausa Tenggara and Bali, Indonesia on Sunday evening has climbed to 91, the National Disaster Mitigation Agency (BNPB) announced in a press conference in Jakarta on Monday. According to The Jakarta Post, North Lombok regency suffered the largest number of fatalities with 72 people killed, while Bali recorded two fatalities. Most victims were killed from falling buildings, the disaster management agency said. According to BNPB spokesperson Sutopo Purwo Nugroho, a week-long emergency status has been declared by the government for East and North Lombok regencies. North and East Lombok saw the most damages, with 80 percent of the buildings in several areas completely demolished by the 7-magnitude earthquake. The sources said that the earthquake on Sunday evening was the main shock while the smaller one on July 29 was the “foreshock”. The powerful earthquake sent thousands of Lombok residents and tourists scrambling outdoors, where many spent the night because strong aftershocks including one of 5.3-magnitude continued to rattle the island. Many areas in Lombok remained without electricity on Monday. Meanwhile country’s President Joko “Jokowi” Widodo has ordered his aides to focus on providing disaster relief in West Nusa Tenggara province. He has ordered Wiranto, the minister for coordination political, legal and security affairs, who was on Lombok for a meeting at the time of the earthquake, to communicate with various institutions on the matter, including BNPB, Social Affairs Ministry and the National Police to help people affected by the disaster and provide logistic support. 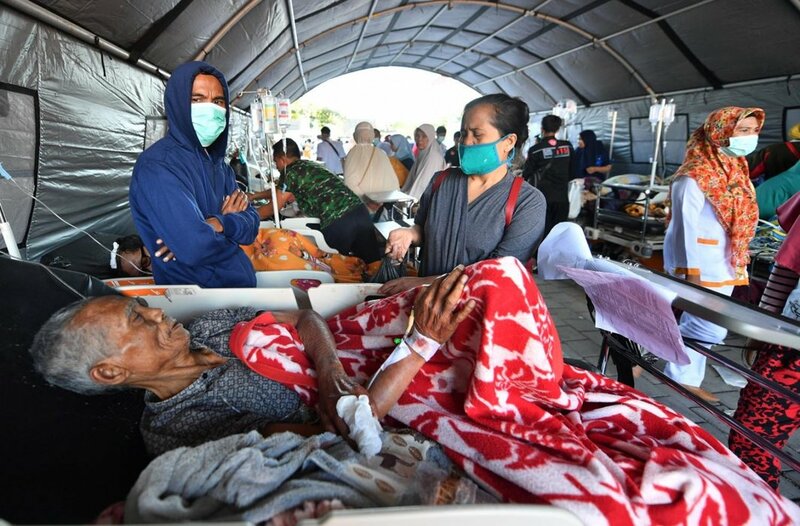 The news sources in Jakarta say that hundreds of bloodied and bandaged victims were treated outside damaged hospitals in the main city Mataram and other hard-hit parts of the island. Patients lay on beds under makeshift wards set up under tents, surrounded by drip stands and monitors. Another Monday morning report says that the ferry service from Bali to Lombok in West Nusa Tenggara has resumed operations after being halted on Sunday evening following a 7-magnitude earthquake on the island. Indonesian security forces and emergency workers were busy in rescue operations searching for survivors under the rubble of houses, mosques and schools which were among thousands of buildings destroyed in the disaster.